In another money related issue, Sen. Massey explained that the Senate was able to budget $25 million to go toward the purchase of new school buses. Sen. Massey said this is a matter which he has been pursuing for the past 3 years, relating how some of the state’s school buses are 25 years old and how the state has been purchasing used school buses from other states to replace their aging fleet. The money to purchase these new vehicles came from unclaimed lottery winnings. Sen. Massey said he was “proud to have been part of this fight” adding that children should not be riding on buses that are 25 years old. In what he called a “big step for school choice,” Sen. Massey explained that a provision was added to the budget that will now allow a certain amount of money to be set aside to be used as a tax credit for contributions toward scholarships for special needs children who can use those scholarships to attend specialty schools. The measure was patterned after a similar program in Georgia, and Sen. Massey said the program has had success in that state as well as in Louisiana and Florida; the program continues to expand to other states. Sen. Massey said this current provision only focuses on special needs children, but if it works, it could have broader implications in the area of school choice in the future. Although Sen. Massey felt a lot did get accomplished in the latest session in the Senate, he did not sound optimistic about a lot getting done in 2014. In fact, given that the entire House of Representatives and state-wide offices are up for re-election, Sen. Massey predicted that the 2014 term, which is scheduled to run from January through June, will actually only last about 6 weeks “if that.” Sen. Massey said that because of the politics, practically speaking, the next term will be done by mid-February. Because of that, any “big stuff” will be seen early in the session. A couple of the big issues Sen. Massey expects to see brought before the Senate early in the session include restructuring and ethics reform. As to restructuring, which centers primarily on the Budget and Control Board, Sen. Massey said this matter is already “pretty far along” with both Houses and expects that if an agreement can be reached before the session begins, this issue will most likely be passed. Sen. Massey said restructuring would allow for a better checks and balance system but did concede if it is not done quickly, it will fall quickly to politics. As for ethics reform, Sen. Massey said there is a perception, due to the way each House of Congress is set up to be responsible for its own members (again, a part of the checks and balances), that “we tend to protect our own.” However, there are Governor-backed discussions to establish an independent investigating committee. Sen. Massey said that if this issue is not resolved by the legislature, it will probably become an issue in the governor’s race. 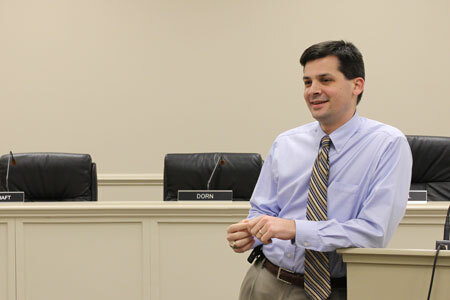 Before closing his meeting, Sen. Massey did discuss topics of interest to those present. The growth of industry and its link to education was one such topic covered, and Sen. Massey complemented the state’s technical schools and their importance in bringing industry into the state by readying the work force. It was agreed, however, that there is a need “to bring more businesses into the schools” so students can see what jobs are available. In a related school matter, Sen. Massey did say that, in regards to redistricting the Edgefield County School Board, “There’s gonna have to be some changes made.” Sen. Massey said he hopes to have some real progress made in this area before his next town hall meeting. He added any changes need to be made “sooner rather than later” due to upcoming elections. The state’s property tax on second homes was also mentioned, but Sen. Massey was not as optimistic as his constituent who felt changes would be made in this area. Currently, residential homes are assessed at 4% and are allotted a school operating credit. However, second homes are assessed at 6% and are not afforded the credit. Sen. Massey said due to the overlapping entities involved in this issue, the state and local municipalities, he did not expect to see any changes made in regards to these taxes. Thursday night’s meeting was the only Town Hall Sen. Massey will be holding in Edgefield County this term. While he said he typically likes to hold 2 meetings during each session in each of the counties he represents, time restraints have made that too difficult this session. However, Sen. Massey still has Town Hall meetings planned in neighboring Saluda and McCormick Counties for those who could not make the Edgefield meeting but do wish to attend one of his gatherings. A list of these meetings can be found at his website.